An airplane’s attitude is determined by the angular difference between a specific airplane’s axis and the natural horizon. A false horizon can occur when the natural horizon is obscured or not readily apparent. This is an important concept because it requires the pilot to develop a pictorial sense of this natural horizon. Pitch attitude is the angle formed between the airplane’s longitudinal axis, which extends from the nose to the tail of the airplane, and the natural horizon. Bank attitude is the angle formed by the airplane’s lateral axis, which extends from wingtip to wingtip, and the natural horizon. [Figures 3-3A and 3-3B] Angular difference about the airplane’s vertical axis (yaw) is an attitude relative to the airplane’s direction of flight but not relative to the natural horizon. Controlling an airplane requires one of two methods to determine the airplane’s attitude in reference to the horizon. When flying “visually” in visual meteorological conditions (VMC), a pilot uses their eyes and visually references the airplane’s wings and cowling to establish the airplane’s attitude to the natural horizon (a visible horizon). If no visible horizon can be seen due to whiteouts, haze over the ocean, night over a dark ocean, etc., it is IMC for practical and safety purposes. [Figure 3-4] When flying in IMC or when cross-checking the visual references, the airplane’s attitude is controlled by the pilot referencing the airplane’s mechanical or electronically generated instruments to determine the airplane’s attitude in relationship to the natural horizon. Figure 3-4. Airplane attitude is based on relative positions of the nose and wings on the natural horizon. Airplane attitude control is composed of four components: pitch control, bank (roll) control, power control, and trim. Pitch control—controlling of the airplane’s pitch attitude about the lateral axis by using the elevator to raise and lower the nose in relation to the natural horizon or to the airplane’s flight instrumentation. 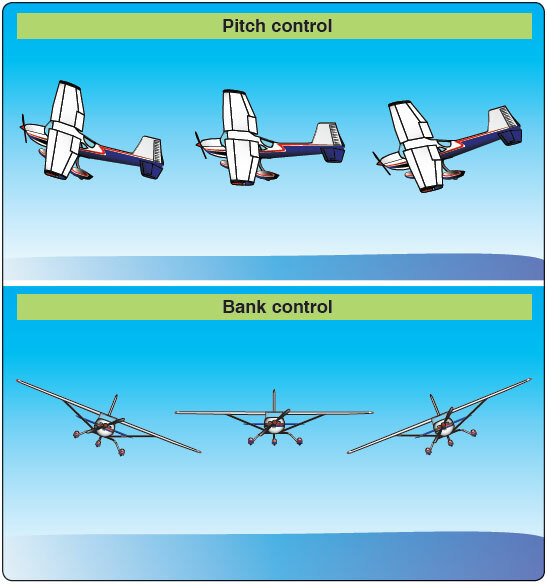 Bank control—controlling of the airplane about the airplane’s longitudinal axis by use of the ailerons to attain a desired bank angle in relation to the natural horizon or to the airplane’s instrumentation. Power control—in most general aviation (GA) airplanes is controlled by the throttle and is used when the flight situation requires a specific thrust setting or for a change in thrust to meet a specific objective. Trim control—used to relieve the control pressures held by the pilot on the flight controls after a desired attitude has been attained. Note: Yaw control is used to cancel out the effects of yaw induced changes, such as adverse yaw and effects of the propeller.